Deodorize porcelain fixtures, such as those found in men's restrooms, with Cherry Screens with 3oz Block. This product eliminates odors with every flush, providing a pleasant cherry fragrance that enhances any regular cleaning maintenance program. It also prevents clogging and flooding by catching gum, trash, and other debris before it gets flushed down the drain. 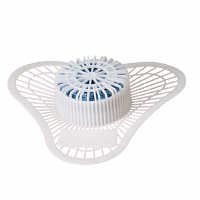 Place this item within the bowl of a urinal; replace when the odor block completely dissolves. Personal Protective Equipment is recommended while handling this product. Cherry Screens with 3 oz. Block is ideal for use in urinals. Typical environments for this item include restaurants, shopping malls, warehouses, churches, schools, office buildings, shipyards, manufacturing plants, and other facilities where restrooms are available for use by the public.